Around 7pm on the 24th of December, I had my very first Catholic mass here in SG. I forgot the name of the church but the place was filled of Pinoys. I was with Best, Ate Cindy, Ate Daisy and her date. The mass was solemn and I was so delighted hearing a mass after 6 months. After the mass, we went directly to Bugis to eat dinner in McDonalds. Actually, we were rushing that time because Best and I need to go to Chinatown to meet Kuya Sam's (Ryan's Tito) family and to eat again. We took the MRT and looked for the Riverside Piazza condominium. We saw the family of Kuya Sam, including the kids na sobrang kukulit! hehehe... We had a dinner again there and I think we ate some chicken, ube, rice, tuna and some fillets. The original plan was to get some food from them and will bring it to our Geylang home where Ate Cindy and Ate Daisy were waiting for us for the Noche Buena. But we failed to do so as the foods on that place seems to be enough and nakakahiya na rin... hahaha. Then we went back home and we just bought cake and drinks from 7-11. We arrived there 10 minutes before 12 midnight. Ate Daisy cooked macaroni sopas while Ate Cindy prepared pizza. We celebrated the night simply but with a bang as Best started to sing using the Magic Sing. His performance was a standing ovation. We were all having a good time. 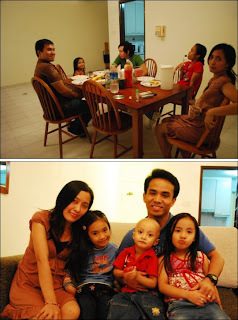 But still, I miss my family in Pasig. There was a little sadness because it was my first time celebrating Christmas eve without them. But looking on the brighter side, I still enjoyed the night. We started to sleep at around 3:30 in the morning but Best was still singing and we just left him to have his "sentimental moment". Morning of the Christmas Day, Best and I went to Seranggoon to visit my officemate's flat. Ate Vinia served us delicious foods, as in masarap talaga. She prepared a saucy hipon, chicken pastel and pansit! 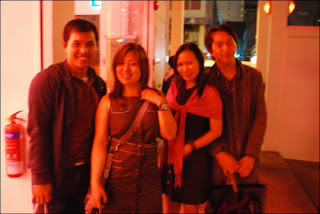 Ate Joie and her Indonesian hubby, Aldy, were waiting for us... Best took us pictures and we were all busy eating the foods. The ice cream was also great, I just forgot the brand. Anyway, Ate Vinia's place was quite nice. Around 3pm I think, we left the place and we headed to Orchard where we met Kuya Sam and his family. We arrived in Palawan Beach in Sentosa I think before 7pm. Ryan's ex officemates way back in West Contact were present. There, I saw Geri, a schoolmate and a batchmate. In this place, again, we ate. We took spaghetti, chicken and a piece of cake. The place was so boring that time. No sounds, the people are few, no glorious lights and nobody was swimming. At past 9pm the group made a pack up and went to Vivocity for picture taking. There, I saw my officemate Gee and took a snapshot with her. It was time to go again. Best and I planned to watch a movie that time. So we went to Cineleisure Orchard and bought two tickets for the movie 'Yes Man'. Yeah, this cinemahouse is operating 24 hours. Besides from our baon na cheeseburger from McDonald's, I also bought popcorn and drinks. Best got some soda, Sprite specifically. The screening time for the movie was 11:45 I think. Before 2 am in the morning, we left the mall and went home. My first Christmas in Singapore was quite nice, so busy and I enjoyed it.